The Common Reading Program for 2015-16, referenced in President Beth Stroble's remarks at Fall Convocation, has been launched in the First Year Seminars. Events in Ferguson last year sparked discussions on campus and across the country about many significant issues. Students, faculty, and staff all called for continued discussions of educational disparities, economic inequities, human rights, race relations, institutional racism, privilege, and a criminal justice system that disproportionately affects communities of color. Anchored in the First Year Seminars, this Common Reading Program is meant to support these important discussions. We will review the requests and determine which requests can be accommodated. The following group of faculty and academic partners developed the 2015-16 Common Reading Program, which will be supplemented by co-curricular programming throughout the year. A group of faculty, student life professionals, and academic partners reviewed a great number of books, essays, and articles. This compilation was selected with the intention of raising awareness and encouraging discussions that will enhance our students’ critical thinking skills and intercultural competence, helping us all to be more engaged global citizens. By exploring these readings, we hope to promote a society in which citizens challenge injustice and value diversity and inclusion. Throughout the academic year, co-curricular events and activities will complement the Common Reading Program and provide opportunities for our campus community to come together to better understand these complex issues and continue these crucial conversations. These programs will include lectures, debates, panel discussions, films, exhibits, and facilitated dialogue. You can learn more about these programs from your First Year Seminar instructor, through involved.webster.edu, or through the Multicultural Center and International Student Affairs (MCISA) department. The essays and articles in this compilation are not about the particulars of what happened in Ferguson last year. Instead, they address the origins of conditions that contributed to those events, and they look towards what can help us to shape a better future. These readings only begin to scratch the surface of these important issues. For those who would like to dive more deeply and learn more, Emerson Library librarians prepared a study guide (see: http://libguides.webster.edu/diversity/CommonReadings). Du Bois, W.E.B. (1920). Of work and wealth. In Darkwater: Voices from within the veil (pp. 49-62). New York, NY: Harcourt, Brace and Howe. Brodkin, K. (2012). How Jews became white folks. In P.S. Rothenberg (Ed. 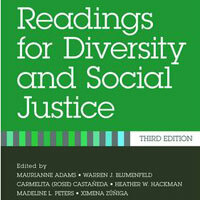 ), White privilege: Essential readings on the other side of racism (4th ed, pp. 45-57). New York, NY: Worth Publishers. This book chapter will be found in the WorldClassroom for each First Year Seminar. Berger, D. (Apr 2014). Is stop-and-frisk worth it? Atlantic 313(3), 54-65. Oliver, M.L. & Shapiro, T.M. (2006). Getting along: Renewing America’s commitment to racial justice. In M.L. Oliver & T.M. Shapiro Black wealth, white wealth: A new perspective on racial inequality. (pp. 175-199). New York: NY.